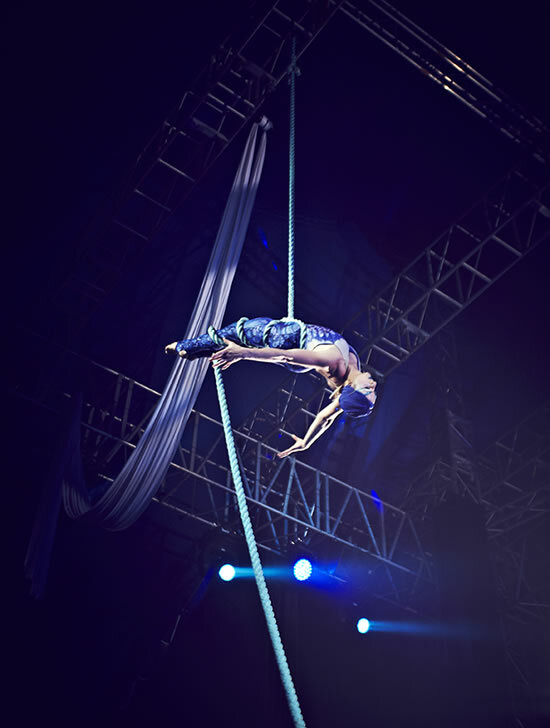 Elemental is a brilliant fusion of circus, theatre and dance that combine to create an exhilarating and magical show. 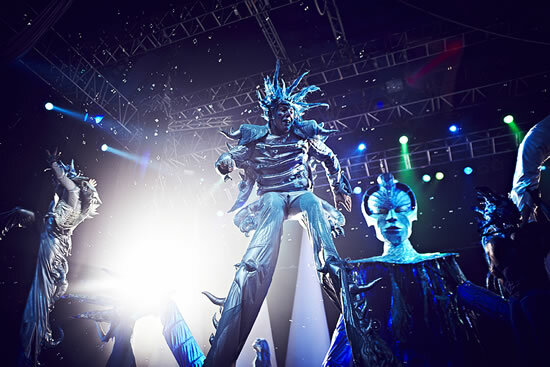 A fantastical and unique cirque production which is ideal for audiences at corporate events and large venues. The show is performed against a beautiful white silk, mountain stage set. The show is choreographed to a diverse and upbeat musical score. 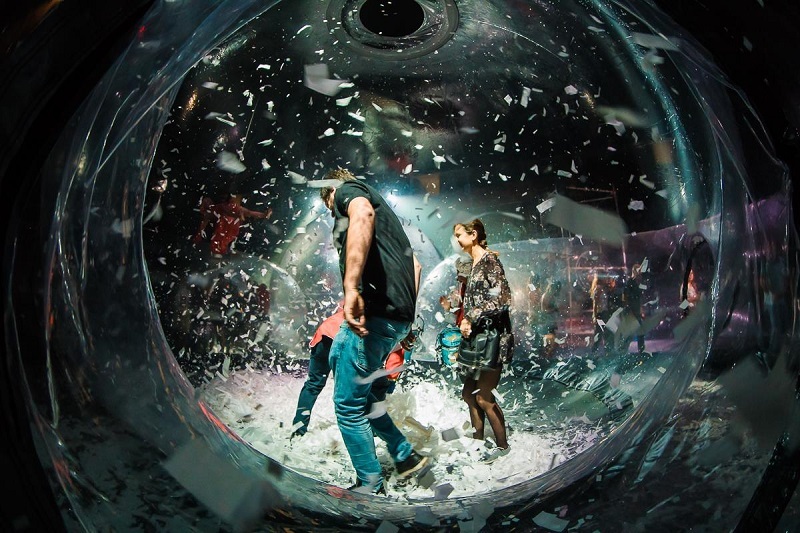 This is a dynamic and stunning show which will leave audiences off all ages mesmerised. The show opens with Mei Mei a young child playing in her bedroom. Her loving mother comes to put her to bed and sings her a lullaby about the four Elements which are depicted in the Childs rooms in four magical gold gilded frames. Mei Mei is awoken from her dreams by one of her favourite toys Ru Ru the endearing clown who has magically come to life. There is a startling noise from her toy box and they both go to investigate. Ro Ro the Harlequin Clown has also come to life! The child is in her element as she plays with these life size toys. 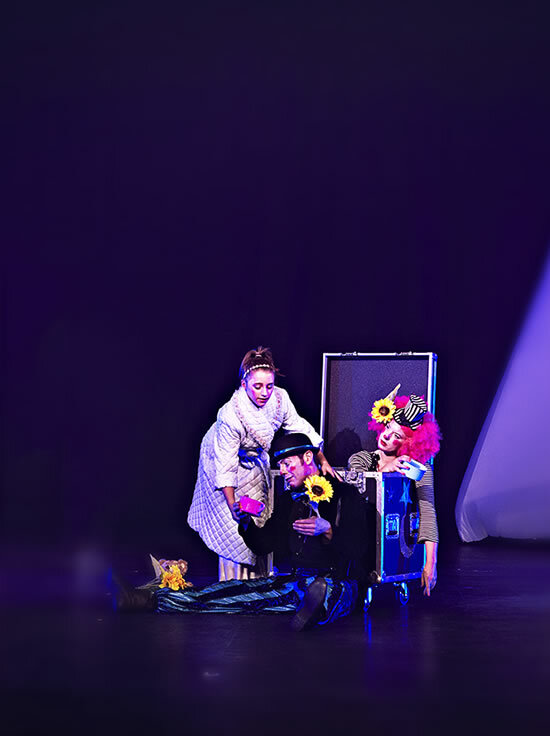 Suddenly a fairy queen enters and the whole of the child’s bedroom comes to life spinning and changing Mei Mei is about to be taken along with the audience on a fantastic journey through the Elemental worlds. A giant thunder crash and it starts to rain Mei Mei and her friends turn her bed into a boat as they sail into the world of water under the ever watchful eye of the fairy queen. The noise of running water can be heard this increases in volume. The child watches in delight as a giant Sea Queen puppet weaves through the audience and onto the stage. Mermaids and mermen dance and tumble with beautiful silk fans. The Fairy Queen sings an operatic song. Mermaids take to the air on sea weed ropes performing amazing feats high above the audience’s heads. The Sea Queen then rises into the air where mermen and mermaids playfully perform on a trapeze suspended within the Sea Queen. 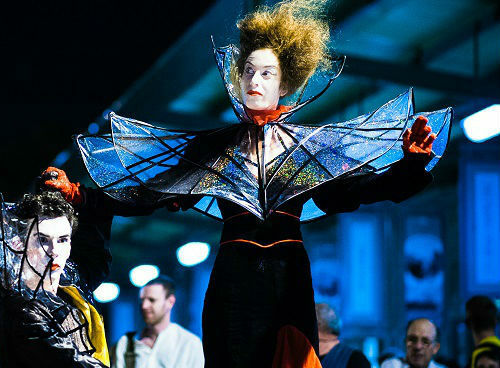 A visual feast, choreographed to upbeat music that is accompanied by live opera sung by the Fairy Queen. The child watches in delight. Four mermaid ballet dancers on point join the watery scene creating a stunning magical scene. Then the watery world starts to fade. Ro Ro and Ru Ru then introduce Mei Mei to the magical world of Earth. The Fairy Queen is lovingly watching over this comic scene. As the child is given a magical seed that turns into a giant flower introducing her to the energetic upbeat world of Earth. The music increases in tempo as the Queen introduces the child to a magical bird who takes to the air performing a stunning aerial hoop routine surrounded by four stunning butterflies. As the beautiful butterflies leave the stage the sound of African drums appears. Six acrobats dramatically enter the stage they perform dynamic and highly skilled acrobatics, amazing tumbles and infectious high energy African dance. This is a dramatic and uplifting performance. The child joins in with the acrobats dancing and singing creating a mesmerising performance. Ro Ro and Ru Ru then take the child on an incredible comedy ride into the world of air why they test out there ridiculous and dangerous flying machine. The Queen majestically enters the stage performing an awe inspiring live operatic number of pie jesu. The child dancers with all of her heart for the queen creating a magical duet. This is accompanied by a fantastical lantern parade that moves through the audience. Giant blue LED lanterns slowly move through the audience these are manipulated by artists in beautiful white costumes and stunning diamante masks creating a very atmospheric piece. The child under the watchful gaze of the fairy queen watches two masked dancers perform a stunning pas du duex on ballet point. 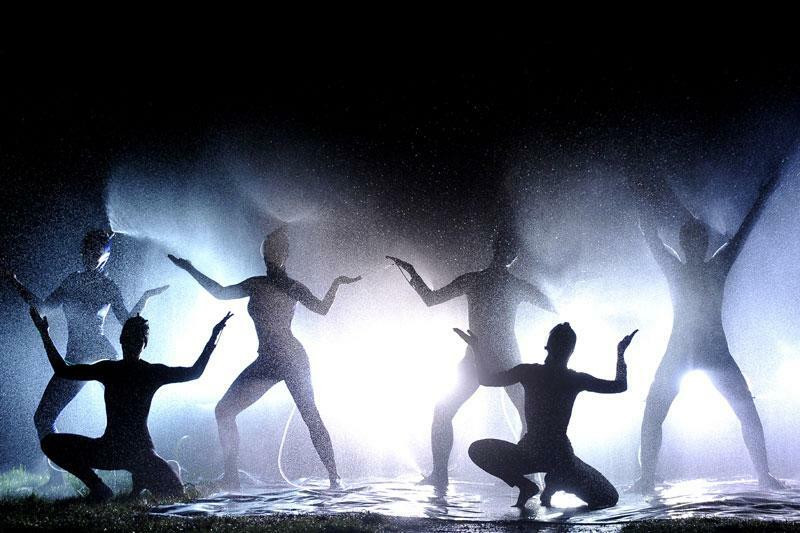 This combines emotive choreography with breath taking lifts creating a magical performance. 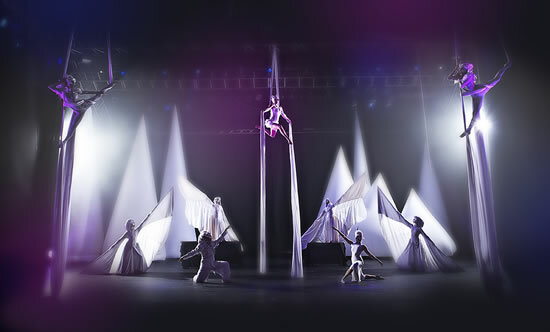 Three aerialists take to the air to perform an ethereal and moving piece in the world of air. The central aerialist is on a flying system and gracefully connects the ground and air through stunning flying lifts. This is framed by two white aerial birds who perform a beautifully synchronised routine combining stunning choreography with dramatic drops, cartwheels and amazing contortions high above the audience’s heads. This dramatic air world builds as five dancers in exquisite wind clocks and masks join the aerialist creating a truly breath taking moment. Ro Ro and Ru Ru then introduce the child to the dangerous and unpredictable world of fire. In a very up tempo comedy scene where the clown sets fire to his head much to the child and audiences amusement. 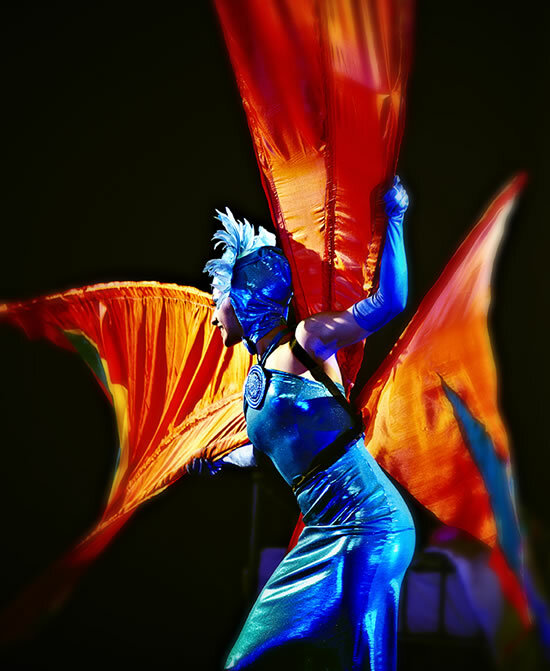 Finally the child experiences the primordial power of fire and is mesmerised by high energy fire dancing, acrobatics and amazing aerial performance as the Fairy Queen sings a contemporary operatic piece, which accompanies a beautifully choreographed fire dance. In the fire world the child experiences and interacts with many fiery creatures. Dramatic performances include dancers with flaming hands. A beautiful fire bird that performs a flamenco duet. The music builds to the finale of this world where characters perform a unique and stunning fire acrobatics piece surrounded with artists playing high energy fire drums and stunning Tai Chi dance with flame red fans. Creating a memorable high energy piece. 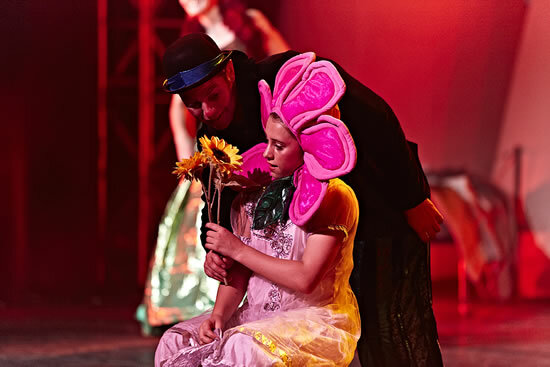 The show builds to the Finale in which the child realises her innate powers and brings together the four elemental worlds under the ever watchful eye of the Fairy Queen and Ro Ro and Ru Ru in a high energy and visual feast involving the whole cast. 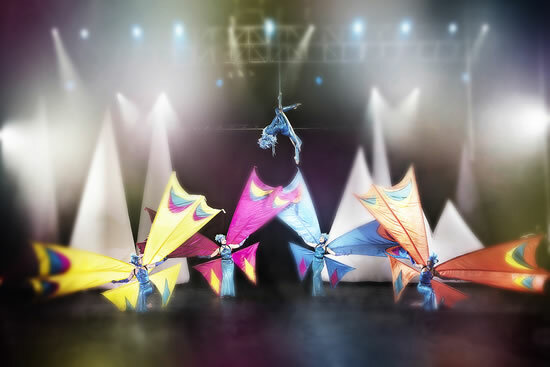 With a spectacular finale with the four Elemental picture frames and a world class flying clouding swing performance. The fantasy world then fades and the child re-emerges into her own world and wakes up in her bed wondering whether it is all a dream. The cast then take to the stage for the final bows. The show lasts between 60 – 90 minutes.